UNITED NATIONS, Oct 23 2017 (IPS) - Fashion is not a sector that exists in a vacuum. In fact, the fashion industry is not unlike any other key economic drivers; it is a key component of a global economy and certainly an important sector to consider when thinking about the UN’s 17 Sustainable Development Goals (SDGs). Most remarkably, a new exhibit in New York at Museum of Modern Art (MOMA) explores just this. Curated by Paola Antonelli and Michelle Millar Fisher, Items: Is Fashion Modern? examines the impact that items of clothing and accessories have had on the world today, including what were considered revolutionary items including, the “Little black dress” and Levi’s 501 jeans. But beyond the exploration of how such mainstream items like the sari and white t-shirt have shaped culture and influenced consumers, the exhibit features another important offering: providing a large-scale illustration depicting Glasgow Caledonian’s Fair Fashion Center and a process called the Quantum Redesign of Fashion. The art form which takes up three large walls in the Museum may very well be the first of its kind to link to the work of the United Nations; in this case using the momentum of the new 2030 Agenda, to demonstrate the larger context of the complex apparel industry and how it informs the global marketplace. The 2030 Agenda was adopted two years by more than 193 member states at the United Nations and were painstakingly negotiated to be universally applicable and integrate economic, social and environmental dimensions as part of 17 goals and 169 targets, which are also known as the Global Goals or SDGs. So, what do the goals mean for an industry like fashion? If you consider that the fashion industry is one of the largest employers in the world, especially of women, with some estimates that women make up roughly 80% of the supply chain, it makes sense that fashion and apparel are involved in not only sustainability discussion– but development- where the sector is a powerful driver of job creation. And not for nothing, fashion is a $2.5 trillion-dollar industry and considered a top user of natural resources and polluter of the communities in which it operates. It’s not surprising then that fashion as an industry is now having a moment, especially in the sustainability dialogue. As such, the MoMA exhibit used research from the Fair Fashion Center and enlisted famed data artist Giorgia Lupi to provide an important visualization of the scope of the fashion industry, especially identifying the sixteen sub businesses that constitute the fashion system – from agriculture and chemicals to real estate and waste management. These distinct but often entangled areas all invariably affect one another. The special artwork outlines how changes in these businesses can impact other areas, but at the same time help deliver on the United Nations Sustainable Development Goals. Featured in this exhibit is the work stream of the Fair Fashion Center (FFC) that has developed what is known as the Quantum Redesign of Fashion which has in just the past two years focused uniquely on achieving sustainability through a profitable means and shifting the conversation to more sustainable business practices. Working with more than 237 global brands and retailers, the FFC is working to tackle impacts created by the value chain and developing actionable solutions that align with the reality of the industry, in key issues like end of use, regenerative agriculture, circular economy, and transport. In many ways, the fashion industry is steadily becoming part of a larger dialogue on sustainable consumption and production, key components of SDG 12, as well as integral to support women in the supply chain, SDG 5 and 8. As with many complex issues, it is envisioned that in depicting viable solutions can create an industry that is a respectful and regenerative ecosystem supporting people, planet and profits. Change can happen through the demonstration of pragmatic approaches and sharing best practices. More importantly, for an industry like fashion to take collective action around sustainability– then perhaps other industries can follow suit. 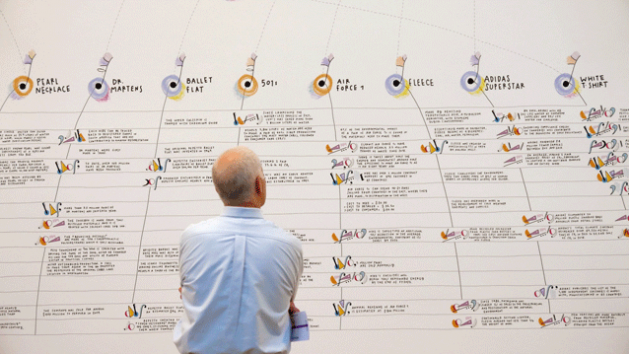 MOMA focuses on rethinking how businesses approach each stage of product development. Can the fashion industry examine the impacts of their actions on each of the 17 Sustainable Development Goals?. Begging the question—can a quantum redesign show how the integrated issues facing the world and industry require an ecosystems approach to solve some of the most pressing issues? Looking ahead, the United Nations is increasingly interested in engaging new and dynamic sectors to play a part in the Sustainable Development Goals. Consider Pritzker Prize winner, Alejandro Arevena who alongside other celebrated architects addressed the United Nations last year to discuss the role of architecture in shaping communities and the built environment. Institutions, including the UN SDGs Fund have introduced powerful industry-advocated individuals such as famed chefs, the Roca brothers to the larger sustainability dialogue. The Roca brothers now serve as SDG Fund Ambassadors with a mission to highlight issues linked to improved nutrition, sustainable agriculture and reducing food waste. In addition, the UN Global Compact recently invited a young group from Copenhagen’s Youth Fashion Summit to the United Nations. The students explored how the (SDGs) allow companies to align their sustainability goals with actionable solutions: from gender equality and poverty reduction to responsible consumption and climate action. This year, the students were asked to transform their ideas for corporate action on the SDGs into a proposed UN draft resolution – the first linked to the fashion sector. Looking ahead small changes in the fashion industry deserve the spotlight and while the MoMA exhibit is only through January, let’s not let this moment pass by unnoticed.